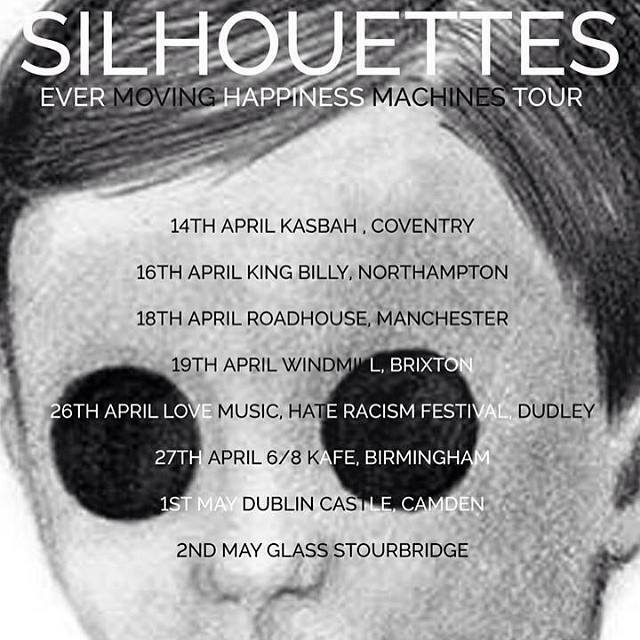 Silhouettes unleash new single ‘Prufrock’s Dream’ on 19th May as a precursor to the release of debut album ‘Ever Moving Happiness Machines’ on 2nd June, both via Integrity Records. Follow-up to debut single and Fake DIY Record of the Week ‘Gold Tag’, ‘Prufrock’s Dream’ is a modern day sequel to TS Eliot’s poem ‘The Love Song of J Alfred Prufrock’ in which a descendant of Prufrock grapples with his political ineffectuality as a member of the voiceless global herd. With influences such as John Grant, Massive Attack and Bon Iver, Silhouettes’ debut album twists and turns from haunting pin-drop falsetto sparseness to crunching post-punk guitars and pumping Moroder-esque electro with a beat and swagger to match their fashionable B-Town neighbours. This entry was posted in News-Posts and tagged debut album, ever moving happiness machines, prufrock, prufrock's dream, silhouettes, UK tour. Bookmark the permalink.